A man from Leighton Buzzard is hoping to promote the town’s small businesses when he appears on TV this week. Peter Gibbons, of the Planets Estate, applied to go on the show through Facebook and enjoyed the experience. He said: “They took us to an antiques centre to learn about antiques and then we went to an auction show. “The idea is that we had to sell the items and make as much money as possible. 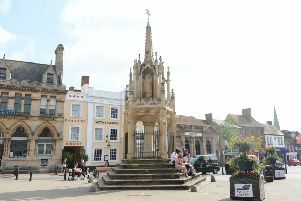 “I wanted to promote Leighton Buzzard and show people what kind of businesses and shops we have here, especially Peacock Mews which people don’t really know about as it is down an alley of the High Street. I had some china, a Georgian box and a devil, I sold them to shops on Peacock Mews, a coffee shop, an antique shop and Raven & Broomstick. “It was good to go on the show and learn more about the antiques trade, I hope I raised the profile of the town. Make Me A Dealer sees antiques dealer Paul Martin search the country in pursuit of a new generation of moneymaking antique dealers. In his episode Peter takes on Pauline from Surrey. They buy anything they want at auction and under the guidance of Paul, the aim is to sell the items on to make a profit. They use their own money and at the end of the show Paul reveals the winner and crowns them Dealer Of The Day. To see if Peter beats Pauline watch Make Me A Dealer on BBC 1 at 4pm on Thursday, November 15.